Well may Bear-thday has finally arrived! YAY!!! This is the first time I am actually getting a party. You can read about why here. My day started with a singing phone call from my grandma, this is a tradition of which I have never been the recipient. Grandma apologized saying she and grandpa wouldn't be able to attend my party. She said she'd be taking care of my grandpa, he discovered yesterday he has a case of shingles. I was confused by this, as I thought you put those on your roof, and I know for a fact that grandma doesn't allow him to go up there anymore. That was sad news on top of the fact that my Aunt Cheryl and Uncle Pete couldn't come either. So only bears and mom and dad came to my party. Ahh, but on with the party. I was distracted by the giant button mom let me see earlier. My newest sit-n-spin toy. Wheeee, and mom thinks she is going to hang it on her sewing room wall, humph! Let's get this party started. Here is my cake. It's a giant button too. Yummy, Key Lime Cake with a little chocolate. Mom got it at Aldi, she added the chocolate. Happy Bear-thday to yoooou, Happy Bear-thday too you. Everybody sang to me. Glad there weren't more than 8 candles. Mom cut the cake. Yum, can't wait., oh yeah, I have to wait till every bear is served. What to do while waiting? Spin. They all got their cake. Uh-Oh, my cake ... oh my presents! Won't you have a piece of cake there's some left? Happy birthday, Buttons!!! I'm glad you had a great party!!! Wow! what a great party! Happy Bearthday! 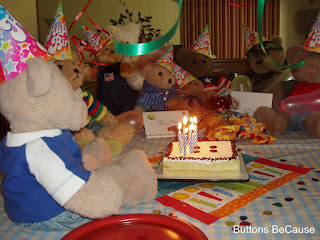 Happy Bearthday! Looks like you had a great party! I'm sorry the turnout was a little less than anticipated and that there were family complications. From the looks of things, your party must still have been a rocking success! Happy birthday, Buttons! That giant button is cool, and you should definitely keep it. Toys are better than decorations, so it's better off if you don't hang it on the sewing room wall. IMHO, anyway. Did you get lots of great presents? 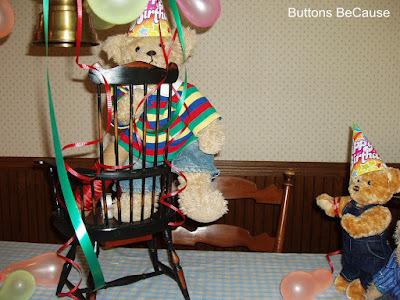 Happy bearthday Buttons! Looks like you had a lot of fun at your birthday too! I like your cake and the giant Button! We ate the entire cake on my birthday, Grobie (the big Beesie) ate all the pieces that were left over!